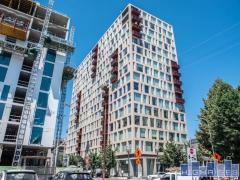 Park Northwest is strategically located on the North Park Blocks in the Pearl District. This mixed/use building has 18 units all featuring floor to ceiling windows, hardwood floors, and sophisticated floor plans. Units range in size from 795sqft to 1,600sqft. "My husband and I were looking for an investment condo in Portland, Oregon, a city we love but do not live in. Stu Stevens turned out to be our greatest asset in finding the just-right place for our needs. We didn't know the market well when we began and had endless questions. Stu's an expert in the condo market in Portland; on the rare occasion he didn't know something, he found out about it in a very timely manner. His negotiations for the purchase on our behalf exceeded our expectations. We were impressed by Stu's professionalism, patience with our questions, and kindness toward everyone involved in our purchase process. For our real estate needs in Portland we wouldn't use anyone else." ~ Jane S.
Have any comments or questions about Park Northwest? Ask your question and/or share your thoughts about this Building.